This is the simplest recipe for rolls in the world. The dough is very easy to work with and it's very tender, almost melts in your mouth. This is also a very good dough for cookies. Cut 1 stick of butter (or shred), mix it with 1 cup of sugar and mash the butter with a fork or knife until it will turn into butter crumbs. Add 1 1/2 cup of flour, mix very well with butter and sugar. In a cup mix 1 egg, 2 tablespoons of water, and 1 tablespoon of sour cream. Pour into the butter-sugar-flour mixture and knead the dough. The dough will be very tender and fragile. Form out of the dough two balls and put the dough into the freezer for 10 minutes. 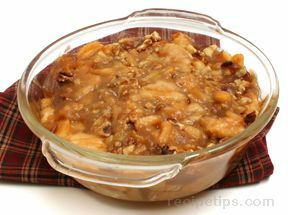 Wash, peel and chop the apples into midsized chunks; add sugar, cinnamon and walnuts. Take out the dough. Take one ball and gently(!) roll it out with a rolling pin. This dough is fragile so don't press too hard. Cut the dough layer into two halves. (This will be your two big rolls that you will cut into the small bite size rolls) on one half of the dough put the apple filling. Add a little of the filling in a row. Then roll the layer with filling in and cut into the small bite size rolls crosswise. Put the small rolls on a baking dish 4-5 inches away from each other as they will become bigger while baking. Repeat the same procedure with the second half of your rolled out dough and with the second ball of dough. ***Tip: I used cream cheese filling for the second ball of dough. The filling is very simple to make: Â¾ of a cream cheese pack and 2-3 tablespoons of sugar mixed. When you mix the cream cheese and sugar spread it on each dough layer and roll it up as I wrote before. The rest of the procedure is the same. Bake at 350 degrees F. for 20 minutes or until golden brown. 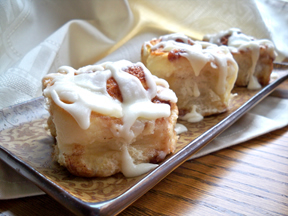 I honestly can't decide which rolls are more delicious: with apples, cinnamon, and walnuts; or with cream cheese. So I usually bake the two versions. It's a very delicious, simple and warm fall dessert.